The U.S. Department of Agriculture is urging residents of the Rio Grande Valley to consume or dispose of any ripe citrus produced on their property in an effort to suppress the population of an invasive species that could cost the regional economy millions of dollars. The Mexican Fruit Fly, or Anastrepha ludens, uses fruits such as citrus as hosts for its developing larvae. Fruits that have been used as hosts are visibly rotten, with soft dark spots where the larvae have been feeding. So long as the consumer sees this and disposes of it properly, they pose no threat to their health. The fly is indigenous to Mexico but has been spotted in parts of the U.S. since 1927. If the fly is allowed to reproduce and spread, then it could put the Valley’s citrus industry at risk. In order to pass inspection, some countries require that produce not be exposed to certain pests or that the preventative measures are taken to ensure that the population of such insects stays under controllable levels. 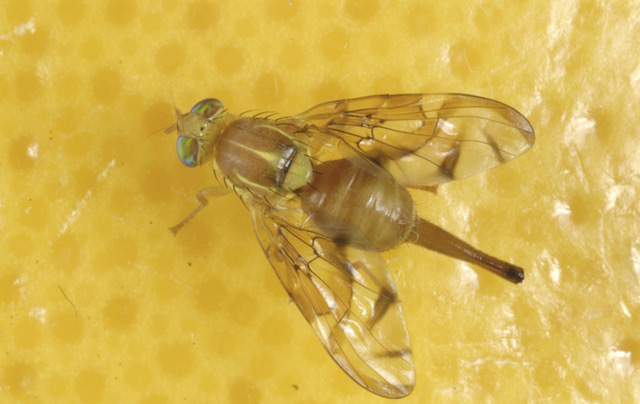 USDA Animal and Plant Health Inspection Service Supervisory Plant Protection and Quarantine Officer Joseph Ramirez said the regional economy stands to lose on trade profits if the Mexican Fruit Fly is allowed to flourish. An outbreak of the invasive species typically happens every two years in the Valley, Ramirez said. In the years in between, USDA uses preventative pesticides to deter the emergence of the Mexican Fruit Fly among other pests that threaten agriculture. The pesticide used by USDA is Spinosad, which is considered organic and “practically non toxic,” according to a 2018 USDA environmental assessment. Additionally, each week the USDA releases between 60-80 million sterile flies locally in an attempt to suppress the population. This is all done in accordance with the Plant Protection Act 2000, which authorizes the Secretary of Agriculture to carry out operations to eradicate insect pests, and to use emergency measures to prevent the dissemination of plant pests. Ramirez said protecting the region’s citrus industry, which is valued at over $70 million a year, is what motivates the USDA’s McAllen office to take necessary action. Ramirez added that the aforementioned measures are mostly taken near known agricultural plots, not residential areas. Residents with citrus plants on their property are urged to pick all ripened fruit off their trees and either consume it, or double-bag it and dispose of it.